Christopher Castellani "All This Talk of Love"
Christopher Castellani is the son of Italian immigrants and a native of Wilmington, Delaware. He resides in Boston, where he is the artistic director of Grub Street, one of the country's leading independent creative writing centers. He is the author of three novels: All this talk of love, A Kiss from Maddalena --winner of the Massachusetts Book Award --and The Saint of Lost Things, a BookSense (IndieBound) Notable Book. In addition to his work with Grub Street, Christopher is on the faculty of the Warren Wilson College Low-Residency MFA program and the Bread Loaf Writers Conference. Christopher was educated at Swarthmore College, received his Masters in English Literature from Tufts University and a Master of Fine Arts in Creative Writing from Boston University. He is currently at work on his fourth novel. Christopher Castellani is the son of Italian immigrants and a native of Wilmington, Delaware. He resides in Boston, where he is the artistic director of Grub Street, one of the country's leading independent creative writing centers. He is the author of three novels: All this talk of love (Algonquin, February 5, 2013), A Kiss from Maddalena (Algonquin, 2003)--winner of the Massachusetts Book Award --and The Saint of Lost Things (Algonquin, 2005), a BookSense (IndieBound) Notable Book. In addition to his work with Grub Street, Christopher is on the faculty of the Warren Wilson College Low-Residency MFA program and the Bread Loaf Writers Conference. Christopher was educated at Swarthmore College, received his Masters in English Literature from Tufts University and a Master of Fine Arts in Creative Writing from Boston University. He is currently at work on his fourth novel. Five years ago, Tia fell into obsessive love with a man she could never have. Married, and the father of two boys, Nathan was unavailable in every way. When she became pregnant, he disappeared, and she gave up her baby for adoption. Five years ago, Caroline, a dedicated pathologist, reluctantly adopted a baby to please her husband. She prayed her misgivings would disappear; instead, she’s questioning whether she’s cut out for the role of wife and mother. Five years ago, Juliette considered her life ideal: she had a solid marriage, two beautiful young sons, and a thriving business. Then she discovered Nathan’s affair. He promised he’d never stray again, and she trusted him. But when Juliette intercepts a letter to her husband from Tia that contains pictures of a child with a deep resemblance to her husband, her world crumbles once more. How could Nathan deny his daughter? And if he’s kept this a secret from her, what else is he hiding? Desperate for the truth, Juliette goes in search of the little girl. And before long, the three women and Nathan are on a collision course with consequences that none of them could have predicted. Riveting and arresting, The comfort of lies explores the collateral damage of infidelity and the dark, private struggles many of us experience but rarely reveal. Randy Susan Meyers is the author of The Murderer’s Daughters, a finalist for the Massachusetts Book Award. She currently lives in Boston with her husband. Mysterious Galaxy is proud to be partnering with Adventures by the Book for an exciting off-site event with author Christopher Castellani in San Diego. Your adventure includes the elegant tea, book discussion, Q&A, author signing, and an opportunity to meet Christopher Castellani up close and personal in an intimate and luxurious setting at the historic Westgate Hotel. Christopher Castellani - author of "All This Talk of Love"
Christopher Castellani - author of All this talk of love Thursday, February 28 - 7:00 p.m. Books & Company Chris Castellani has published two previous novels, A Kiss from Maddalena, which won the Massachusetts Book Award for Fiction; and The Saint of Lost Things. He is the artistic director of Grub Street, the Boston-based non-profit creative writing center. All this talk of love is the story of the Grasso family: Italian immigrants Antonio and Maddelena, their adult children Prima and Frankie, and their grandchildren. In a year that will change their lives forever, Prima and Frankie travel with their parents back to their ancestral Italian village, Santa Cecilia. The trip, and Italy itself, takes on different meanings for each family member as it approaches, and as secrets from the past – especially unanswered questions around the death of the family’s first-born son – are revealed. Christopher Castellani, himself the son of Italian immigrants, brings his unique and insightful perspectives on the immigrant experience -- indeed, the American experience -- to every page of All this talk of love. Drawing on his rich understanding of both Italian culture and the mechanics of a family, Castellani paints an incredibly moving, tender, and textured portrait of the many generations of Grassos and the ties that bind them. Christopher Castellani's book All This Talk of Love was available from LibraryThing Early Reviewers. 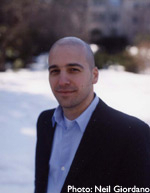 Christopher Castellani is currently considered a "single author." If one or more works are by a distinct, homonymous authors, go ahead and split the author. Christopher Castellani is composed of 3 names. You can examine and separate out names.